My Mom’s birthday is just round the corner and I planned to get her a gift which seems to be stuck somewhere else for now. In a bit of desperation, I turned to the beauty counters and my eyes fell on the Lancome Genifique Youth Activator Serum. Aha! 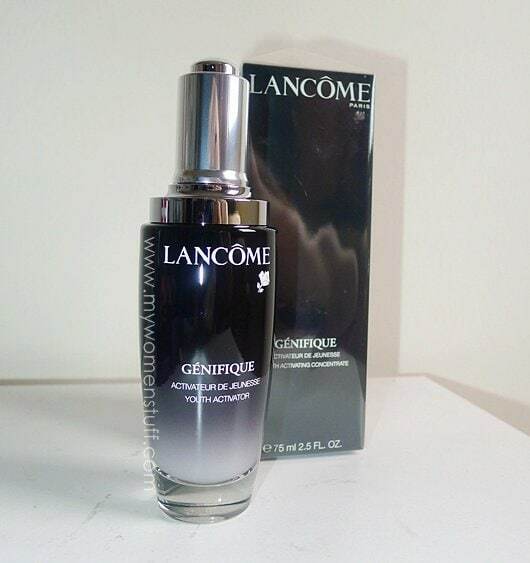 Its been a year since the launch of Lancome’s Genifique serum, but its still doing well and the new giant sized bottle is testament to its success 😀 This is the new 75ml bottle of Genifique which will last Mom a while. Lancome Genifique retails at RM295/30ml and RM580/75ml at all Lancome counters. thanks for sharing.then i can forget about trying this coz not yet reach the required age.LOL..
My mom loves when I’m given anti-aging creams and serums – she knows she’s going to get it all!^^ I’ve never received any samples of Génifique, though. My mother is on One Essential by Dior and we’re taking pics to see whether it is worth it. She’s pretty vain – maybe I got it from her!^^ – and always willing to try new “miraculous” stuff. If One Essential doesn’t work, maybe I’ll buy her some Génifique! BTW, I’m trying Olay Total Effects! It’s good to hear that it works better on mature or sun damaged skin. That will make a good present for my mum too. ooo…I was thinking the way u do about the genifique but was told that prevention is necessary and when it comes to the age when I need it, it’s a tad too late…so i gave in. I’m just 24 reaching 25 in few more months and had used up two bottles consecutively. However, the 2nd bottle did not make any difference on my skin after all so I’m now trying SK-ii. My skin could have accustomed to it so I had to try some other brands and come back to it latter. A bottle lasted me a month and so but it is worth for the money i suppose, because my laugh lines were visibly soften. I’m 25 and my laugh lines are really starting to bother me and I’ve never noticed them before. My makeup gets caught in them too! Its terrible and depressing. I am trying to find a product that will get rid of them or at least soften them ALOT (not by because of some temporary filler but something with real lasting effects even after I stop using the product for a couple months). Any suggestions? I am getting married this year and I have to get these smile lines taken care of ASAP. PLEASE HELP!